Poll: Would you let someone else use your motorhome? 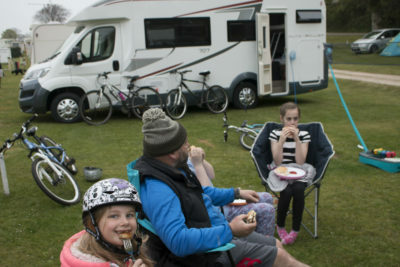 Many motorhome owners have saved up for years to buy their leisure vehicle – or even used some of their retirement pot. Or some motorhomers might be paying back a hefty bank loan or finance agreement… So would you consider letting someone else use your motorhome when you’re not? Our motorhome insurance policy has the option to add a permanent or temporary additional driver on to the policy which can be a way to let a family member or close friend experience the joy of motorhoming with the peace of mind that they’re covered by our extensive insurance policy. But our policy does not offer cover for owners who want to hire our their motorhomes for financial reward or for business use. So if you’d charged someone to borrow your motorhome and they caused any damage or were involved in an accident then you would not be covered. So, in this month’s community poll, we’d like to know if you’d consider letting your friends, family or even a complete stranger use your motorhome? May be you’d be happy to let someone use your motorhome if you drove and set it up on a campsite – but wouldn’t be happy for them to drive it. Vote using the buttons below and as always tell us what you think about someone else using your motorhome in the comments section below. Would you let someone else use your motorhome? We’ll report the results in March 2018. Most definitely not! It would feel like giving away a family member. Tricky one this. I would have to say it depends on the individual. Your motor home is an extension to your house. My wife and I are quite particular about our personal space and there would only be a limited number of people we know would treat it with the same care as us and then I as a professional driver would be mindful of whether they would drive it ok. I’ve seen people in hire vans….. scary, very scary. I wouldn’t want my motor home driven similarly, there’s a world of difference between the family hatchback and a 20 something foot home on wheels. I am undecided at the moment, our motorhome is over 3500kg so those in my family who would like to borrow it don’t have a driving licence with the required C1 category. If they had they would also have to demonstrate to me that they could drive it safely, whilst they have been camping with us a number of times so know the ropes of camping and also help to clean and maintain it inside and out and know how precious it to us, would I trust them with it out of my site, I don’t know. Perhaps when I have scratched and dinted it I might change my mind. No definitely not. Nobody looks after you camper like you do. It also takes a long time to build up all the camping knowhow and tricks of driving a much larger vehicle. It’s so easy to make a mistake, the van is then damaged and it will never be repaired back as good as new, you can guarantee that.